NEW SPA - Charming house with the pool on the top of the hill with super view. Property 18: NEW SPA - Charming house with the pool on the top of the hill with super view. Charming villa in nature with POOL. Property 39: Charming villa in nature with POOL. Lovely hidden villa in a nice location. 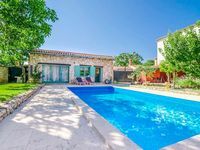 I highly recommend this villa offers privacy nice garden and pool. Still walking distance to everything. This unique Villa had its own charm and was situated nicely. The town is full of history. We rented a vehicle to do some sight seeing and to move around.